Therefore your key SEO elements on your “Contact Us” page should include the Company Name, Zip Codes and if you have a physical address, then this is the page you should list that information in META data and body copy. 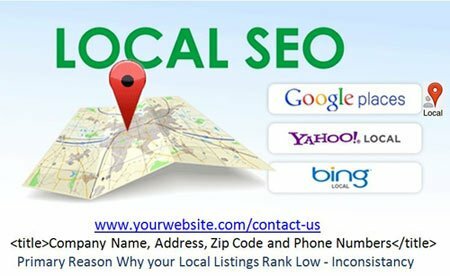 You may have a tough time getting found in local search profiles like Yelp, Yahoo Local, Google+ Local and others if your website is not consistent with the Name, Address & Phone Number info your are providing to these local profiles. So let’s take a look at your Title and Description Tag for your Contact Us page. It is also important to have a few high value keywords used properly in these two elements. Start by entering a 2-3 word keyword phrase you consider valuable. Then provide the actual city your business is located in. Finally, go to your contact us page, copy the URL and add it to the third field below. Does your company name, city and primary keyword appear in bold? If not, that may be one of the reasons why your listing struggles in Google Maps when prospects are searching for your business. The Title and Description tags on the contact us page can and should be corrected and we can help you do that if you don’t know how.